I found this recipe here. My oldest son loved these cookies. Then beat the butter, peanut butter, and sugar in a mixer on medium speed for two minutes. Next turn the mixer on low and add in the egg, milk, vanilla, and red food coloring.Mix for 30 seconds to incorporate. Then put the mixer on medium and mix until light and fluffy. In a different bowl sift the cocoa, flour, baking soda, and salt. Put the mixer on low and add the flour mixture to the sugar mixture and beat until just combined. Next shape the dough into 1 inch balls. Put the red sanding sugar onto a small bowl or plate. Roll the dough balls in the sanding sugar and place on a prepared cookie sheet 2 inches apart. Unwrap the Kisses while the cookies are baking. 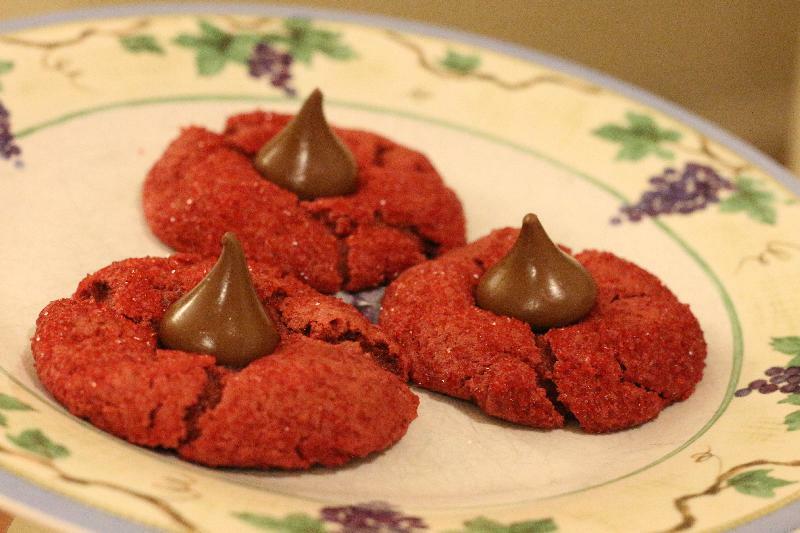 When the cookies are finished baking remove from the ovne and press a kiss into the center of each cookie. Finally let the cookies cool and then enjoy.